A troubling video shows an elderly man being tasered by Florida police officers after he exits his vehicle with his hands up. Witnesses gasp in terror as the man falls to the ground unconscious. When the ‘suspect’ gets out of his car, the footage shows police officers shouting at him and twisting his arm. 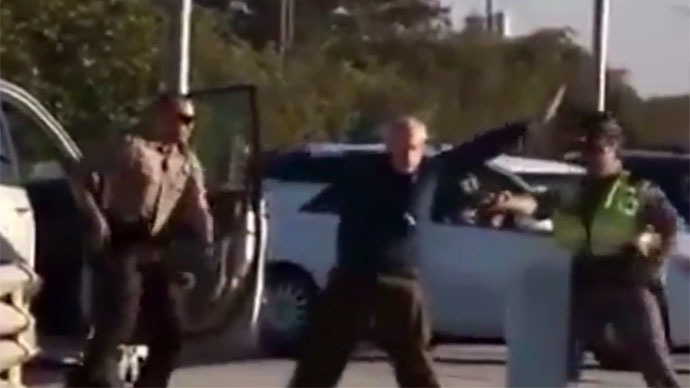 The man then raises his hands, is immediately tasered and falls to the ground. Police then proceed to cuff the man as he lies on the ground unconscious. The video was shot by a tourist who was on his way to Key West with his family for the weekend. The camera captured witnesses gasping in terror in the background, with a lot of concern over the man’s age. Florida police have been widely criticized for what the public regards as excessive use of Tasers. The most notable instances include a January incident in which Key Largo teen Roberto Ornelas died after being tasered on New Year’s Day. Amnesty International reported that between 2001 and 2008 at least 351 people died in the US after being tasered by police officers.